GWIN: A CORNISH WORD MEANING "WINE"
Located in Scottsdale, GWIN provides a fun, casual, and unique venue for wine and beer lovers alike to comfortably enjoy a wide selection of wines and beers. The Manuel family bring you GWIN Wine and Beer. We feature a diverse portfolio of wine and craft beer produced locally in Arizona and across the United States. Our wine and beer can be complemented by light food offerings, which are sourced locally! At GWIN, we like to see you happy! Join us for happy hour from 3PM to 7PM daily! Enjoy $2 off all glasses of wine and $1 off of the beer of your choice! 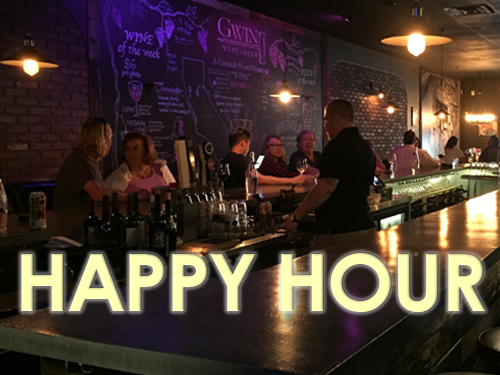 Visit GWIN on Tuesday's for $25 bottles of wine (select varieties)! Come by GWIN on Wednesday's for a bottle of wine and our delicious baked brie for only $35! Join us at GWIN on Thursday's for a cornish pasty (coming directly from the one and only, local, Cornish Pasty Co.) and a pint of any of our draft beers for $15! Bring a friend, family member or other significant other to Date Night at GWIN on Thursday's. $30 gets you a charcuterie board & a wine flight to share! LIVE MUSIC: We love to bring in live music each week! Check out our social media pages on Facebook and Instagram (links below) for the most up-to-date information on weekly live music. Hope to see you there!